Candlewood Suites Dallas Market Center , is an all-suite, extended-stay hotel located near several Dallas hospitals including Children&regs Hospital, UT Southwestern, Presbyterian, Baylor and Scottish Rite. The Candlewood Suites Dallas Market Center, is just moments away from the Dallas Convention Center, American Airlines Center and downtown Dallas. Guests visiting the area can enjoy a variety of professional sports teams including the Dallas Mavericks, Cowboys and Stars. Fully equipped kitchens in every suite make this hotel the perfect option for the extended stay traveler. Large work desks, two line phones and free high speed Internet access make the Candlewood Suites the ideal extended stay hotel choice for the corporate traveler. The Candlewood Suites is the perfect "home away from home" for relocation, project, temporary assignment or training needs. 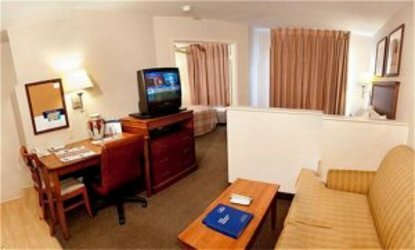 Candlewood Suites offers both studio and one-bedroom suites. You can relax in the overstuffed recliner while you enjoy the DVD player. Borrow your favorites from our free video library. In our Candlewood Cupboard, you can purchase meals, snacks and sundry items at value prices. Additionally, unlike a corporate apartment, the Candlewood Suites does not require a lease or minimum length of stay. Whether traveling to Dallas for business or leisure, for one night or several months... Candlewood Suites Dallas Market Center is the solution to your temporary housing needs. This hotel is committed to providing accessible facilities under the American Disabilities Act. If your accessibility needs are not met, please contact the Hotel Manager on Duty. Should you require additional information regarding accessible facilities for guests with disabilities, please call 1-800-Holiday (U.S. and Canada) or contact the hotel directly. For the hearing impaired, TDD service is available at 1-800-238-5544 within the U.S. and Canada.